The reader in me has always loved this book – it is a great celebration of reading – each character we encounter has a favourite book and each book is different which emphasises to children that readers are unique with individual tastes and preferences. I discovered on rereading this, that this is a great book to help explain the concept of genres to children, as each character likes a different type of book or reading matter (non-fiction and a newspaper, for example). This book is another great example of the creative partnership between a wonderful writer and a superb illustrator that has resulted in so many gorgeous picture books. 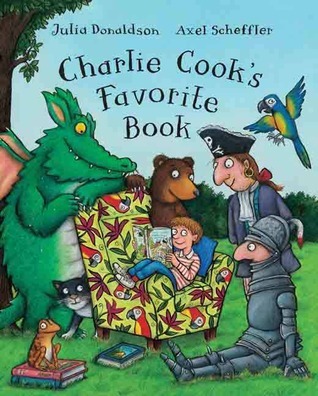 Charlie Cook’s favourite book / Written by Julia Donaldson and illustrated by Axel Scheffler. Published by Macmillan Children’s Books, 2010.